I made bread. Let me type that I again. 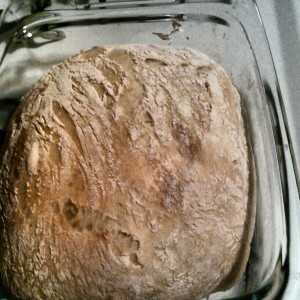 I made bread! And I am embarrassingly satisfied with myself for accomplishing something that billions have managed to pull off ever since humans first gave-up hunting and gathering for this whole civilization experiment. Baking bread, and baking in general, has always been a bit of a barrier to me. Something outside my core competency. I’ve seen people make bread, but the recipes just seemed doomed to failure in my hands. But last week I was reminded of a supposedly simple can’t fail recipe. I had the ingredients about and figured I’d give it a shot. In a large bowl combine the flour, yeast, and salt. You can also add ingredients as desired (raisins, nuts, etc.). Add water, and stir until blended. Cover bowl with plastic wrap. Let dough rest at least 12 hours, but preferably about 18, at room temperature.The dough is ready when its surface is dotted with bubbles. Lightly flour a work surface and place the dough on it. Sprinkle the dough with a little more flour and fold it over on itself twice. Cover loosely with plastic wrap and let rest about 15 minutes. Using enough flour to keep the dough from sticking to work surface or to your fingers, gently and quickly shape into a ball. Put the dough down on a re-dusted work surface and dust with more flour, bran, cornmeal or whatever you’d like. Cover with a cotton towel and let rise for about 2 hours. When it is ready, dough will have more than doubled in size. At least a half-hour before dough is ready, heat oven to 450 degrees. Put a 6- to 8-quart heavy covered pot (cast iron, enamel, Pyrex or ceramic) in oven as it heats. When dough is ready, carefully remove pot from oven. Slide the dough into pot. It might look like a mess, but that’s just fine. Cover with lid and bake 30 minutes, then remove lid and bake another 15 to 30 minutes, until loaf has browned. Bread! And a house that is filled with the smell of fresh baked bread. For almost zero active work! I’m very excited to experiment with additions and twists to this recipe and to have fresh bread around as the weather cools in these dark winter months.